You configure here the domain name system (DNS) services for the Smoothwall to use. The default behavior is to use the internal DNS server, unless one has been specified during installation (see Using the Quick Installation Method or Using the Advanced Installation Method). A DNS resolver translates domain names back into IP addresses. You can configure the Smoothwall to either use its own internal DNS proxy to resolve domain names, or specify an external server to use. The Smoothwall’s default behavior is to use the internal DNS server, unless one has been specified during installation (see Using the Quick Installation Method or Using the Advanced Installation Method). 1. Go to Network > Configuration > DNS. You must ensure you configure the details for the DNS server that the DNS proxy uses to resolve DNS requests. For more information, see Configuring the DNS Servers (Forwarders) . Enter the IP address of the primary DNS server to use. Optionally, enter the IP address of the secondary DNS server to use. The DNS proxy service is used to provide internal and external name resolution services for local network hosts. You can configure a list of DNS servers for the DNS proxy service to use when resolving requests. You can also apply a load balancing pool to a specific DNS server to ensure that connections from your Internet Service Provider (ISP) are sent to their own DNS server — this is a requirement of most ISPs to ensure requests to their DNS servers are made over their connections. 2. From the DNS forwarders panel, click Add new DNS forwarder. • Status — New DNS forwarders are enabled by default. Clear the check box to create a disabled DNS forwarder. • Server IP address — Either enter the server IP addresses, or click the down arrow and select the relevant DNS IP addresses, or ranges. Optionally, select Save selected objects as group to create a new address object that can be re-used in other areas of the Smoothwall’s user interface without re-entering each individual IP address, or address range. For more information about using address objects see Working with Address Objects . • Link Load Balancing pool or Local IP address — To assign a load balancing pool to this DNS server, select the relevant pool from the drop-down list. If the DNS server is not globally accessible, it is recommended you assign a load balancing pool. Alternatively, leave this option as Default to use the Default LLB pool configured under Network > Configuration > Source NAT & LLB policies (see Using Source NATs and LLB Policies ). • Comment — Configure an optional comment for this DNS server. An additional button, Show comments, appears on the DNS forwarders table if any comments are configured. Clicking this displays configured comments under the server IP address. In order for network clients to use the Smoothwall’s DNS proxy service, you must ensure an external access rule for DNS, on port 53, exists for the interface they use to connect to the Smoothwall. 1. Go to System > Administration > External access. • Interface — Select the interface network clients use to connect to the Smoothwall. For a detailed description of using external access rules, including how to configure them, see Configuring External Access Rules. 2. From the DNS forwarders table, highlight the DNS server, and click Edit. 3. Edit the configuration as required. 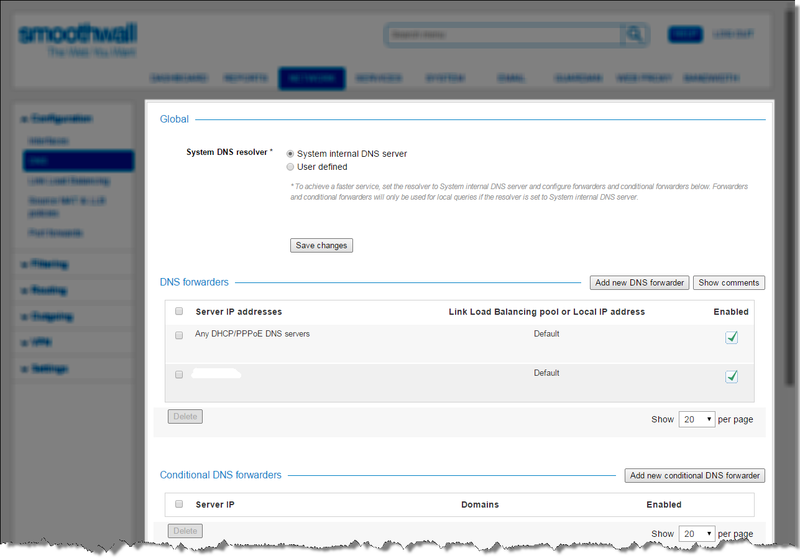 For a detailed description of each setting, see Configuring the DNS Servers (Forwarders) . 2. From the DNS forwarders table, locate and highlight the relevant DNS server. You can configure a list of additional DNS servers to override the DNS servers configured in the DNS forwarders table (see Configuring the DNS Servers (Forwarders) ) within specific domains. For example, an Active Directory domain may be required to query an internal DNS server for internal hostnames, rather than an external server. 2. From the Conditional DNS forwarders table, click Add new conditional DNS forwarder. • Status — New DNS servers are enabled by default. Clear the check box to create a disabled DNS server. • Server IP — From the drop-down list, select the IP address of the domain-specific DNS server. • Domains — Enter the domains that belong to this DNS server. An additional button, Show comments, appears on the Conditional DNS forwarders table if any comments are configured. Clicking this displays configured comments under the server IP address. 2. From the Conditional DNS forwarders table, highlight the DNS server, and click Edit. 3. Edit the configuration as required. For a detailed description of each setting, see Using Conditional DNS Forwarders . 2. From the Conditional DNS forwarders table, locate and highlight the relevant DNS server. Note: Deleting a DNS server from the Conditional DNS forwarders table does not remove it from the DNS forwarders table. To ensure the DNS server is not used by any network client, it should be removed from both tables. Adding static DNS hosts allows the DNS proxy to override, or add to, external DNS resolutions. Hostname to IP address mappings affect all hosts using the DNS proxy. However, it should be noted that your installation of the Smoothwall may not be configured to use the DNS proxy. For more information, see Configuring Global DNS Settings and Configuring the DNS Servers (Forwarders) . Note: The Smoothwall itself resolves static hostnames regardless of whether the DNS proxy service is enabled. 2. Click Add new static DNS host. • Status — New DNS host mappings are enabled by default. Clear the check box to create a disabled DNS host mapping. • Host IP addresses — Either enter the host IP addresses, or click the down arrow and select the relevant DNS IP addresses, or ranges. • Hostnames — Enter the hostnames to resolve from the IP addresses. You can either enter a single hostname, or list multiple hosts, each on a new line. • Comment — Configure an optional comment for this DNS host. An additional button, Show comments, appears on the Static DNS hosts table if any comments are configured. Clicking this displays configured comments under the IP address. 2. From the Static DNS hosts table, highlight the DNS host, and click Edit. 3. Edit the configuration as required. For a detailed description of each setting, see Mapping Static DNS Hosts . 2. From the Static DNS hosts table, locate and highlight the relevant DNS host.